At upriseVSI, we’ve been lucky enough to have worked with a selection of clients in the fashion and apparel industry. Our thinkBooker online booking and scheduling system is being used by online fashion platform, FARFETCH, as part of their “Store of the Future” concept for Browns, their luxury fashion boutique in Mayfair, London. We were also recently appointed by renowned menswear company, Dyfed Menswear to create a new brand identity, web presence and digital strategy for the business. By 2020, experts claim that the fashion and apparel industry will see double-digit sales growth in an expanding global market. Closer to home, by then 28.8% of the UK’s total fashion spend will be from online sales. With this in mind, we take a look at how a tailor-made digital strategy can help businesses in the fashion retail sector succeed in a fast-moving, competitive marketplace. A focus in the business world for many years now, digital transformation is no longer a passing trend or short-lived buzzword. In fact, digitising the ways that clients and customers interact with a business is now seen as a necessity. Young fashion customers are using a range of digital platforms to get information, exchange experiences, compare prices and engage with brands. Often, this will mean an e-commerce website for a fashion brand. However, there is also an opportunity to use automated tools, apps, chatbots and other digital systems to improve the customer journey. Integration with social media is also important, not only for marketing purposes but also as a direct route for customers to converse with brands. There’s even an opportunity to combine these digital platforms with the bricks-and-mortar element of the business. In the future, we could see more stores being equipped with interactive mirrors which can take a customer’s photograph in their new outfit, post it to their social media profiles and get feedback from friends before they buy it. Rather than simply serving to provide pre-purchase information, digital channels have now become standalone transaction platforms. Nowadays, consumers expect a seamless shopping experience, requiring retailers to fuse links between these channels. They also expect to be able to find what they want on any device, be it a laptop, smartphone or tablet. Responsive website design can solve this in terms of the customer experience. However, it’s worth remembering that this should also be reflected in the admin section of the digital applications. It’s just as important for staff to be able to update content, images and product details on any device. 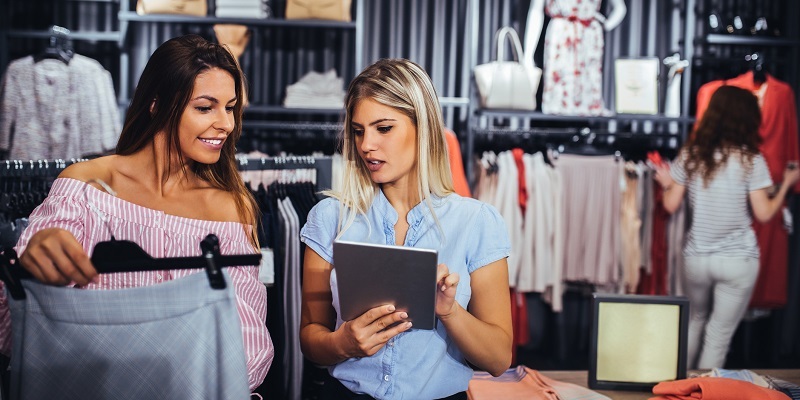 Fashion and apparel brands can also make a customer’s store experience closer to the one they have online by providing staff with tablets that can allow them to access a customer’s online history with the brand. Businesses of all kinds, including those in fashion retail, are collecting more and more customer data at all kinds of new touch points. In light of the new General Data Protection Regulations coming into effect, the compliant collection, storing and processing of this data is more important than ever. A back-end system that can collect this data and present it in a user-friendly format will not only provide valuable customer insight but also make it easier to access, update and delete data as and when you need to. Abandoning a basket is a big problem for fashion retailers. The most common reasons for visitors leaving a site without making a purchase include unexpected shipping costs, creating a new account and conducting research. Streamlining the checkout process can counter these issues and make it easier to answer a customer’s questions before they abandon a purchase. Software can be used to send automated emails that remind those who have abandoned their baskets to come back and purchase the item, notify them when reductions are available or even incentivise them to purchase. Ultimately, customer and user experience has to be the focus for businesses in the fashion retail sector. This will only be achieved with seamless front and back-end integration between digital platforms. It’s crucial that your website “speaks” to your own internal software as well as any third-party solutions. An efficient means of monitoring data will not only allow for smarter inventory, pricing, and fulfilment decisions but also ensure that the business can profit and grow in an ever-evolving digital environment. If you’d like to see how we could help your fashion brand improve its digital presence, get in touch today.